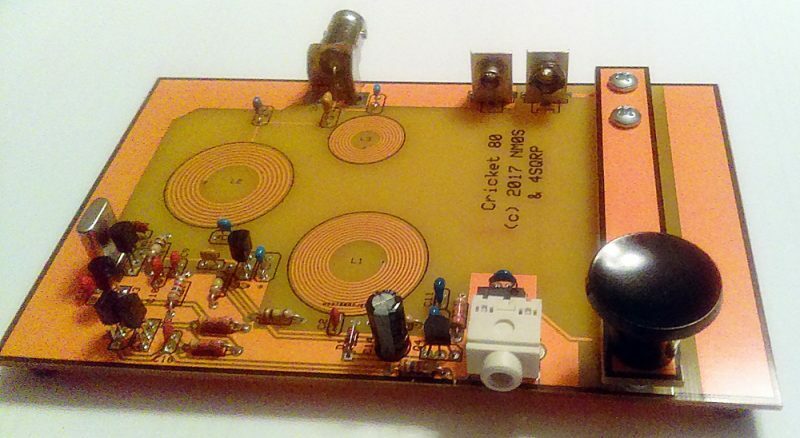 The Four State QRP group has just released The Cricket: a simple 80 CW transceiver kit. The Cricket was designed by David Cripe (NM0S) who is behind a number of successful kits (including the Ozark Patrol and the Bayou Jumper). The amazing part about this kit is that it’s super simple, has no toroids to wind and doesn’t even need to be aligned. It even includes a Morse key. All this shipped for $32.68 in the US, $39.50 in Canada and $43.50 for international orders. A serious bargain, in my book. Click here to order The Cricket. 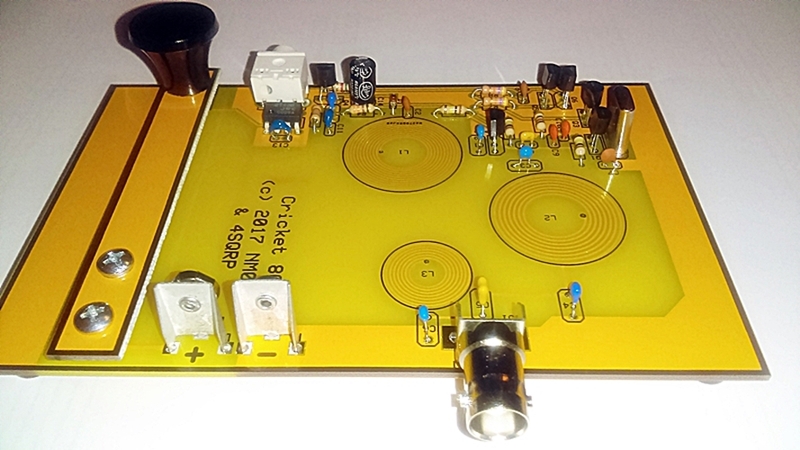 The Cricket is a low cost entry level minimalist CW transceiver for the 80 meter band. Chosen as the build session kit for OzarkCon 2017, it bears a family resemblance to the well known but much lower performing Pixie. However it is very different and vastly improved over the Pixie. This is NOT a Pixie, it is far superior! It features low parts count, better components including MOSFETs for better sensitivity and switching, and a modern NJM2113D audio amp. A TX/RX offset is also incuded so that you can work other stations that have zero beat you, or are using a crystal on the same frequncy. Full QSK and a sidetone complete the essential operating features. Dave’s famous etched spiral coils are included on the pc board, so there are NO TOROIDS to wind. Additionally a straight key is included on the pc board, just snap it off, mount it on the board, and the whole rig is then self contained. Also included is an electronic keyer adapter – you can use your favorite keyer with the Cricket! These are many features for such a low parts count and inexpensive transceiver. ALL THROUGH HOLE parts make this kit very easy to assemble. It will make a fine, fully functional, and educational first rig for a new builder, the new ham, or seasoned veterans wishing to just have fun with a new rig at minimal expense and effort. Note that Novices and Technicians have 80M CW privileges from 3.525 to 3.600, same as everyone else – so they also can build and use the Cricket. This simple rig is fun and functional, and made many contacts at OzarkCon after the build session. A proven design and a great choice for your next rig, it is perfect for a group build with nets and contacts after the build. This is an excellent club project. This entry was posted in Ham Radio, Kits, News and tagged Dave Cripe (NM0S), David Cripe NM0S, Four State QRP Group, Kits, NM0S, The Cricket, Transceiver Kits on April 26, 2017 by Thomas. I am a very old geezer so I need a couple of magnifying glasses in series to read the capacitor values. Nevertheless, I built the kit and the sidetone works and I can hear it on my regular transceiver. I can also turn my regular transceiver way down in power and hear it on the Cricket. However, I would think that I could hear background noise on the Cricket, but I hear nothing unless I run my regular transceiver at about 0.25 watts. Is there something wrong with my construction, or is this normal? Of course, I have a 80 m dipole connected to the Cricket. Yeaaaaah! Just ordered my Cricket. Now to get the inverted L up in my little 100′ long back yard and work some across the state line DX. Who says you can’t live your novice childhood all over again. 70 years old and haven’t had this much fun of expectation in a looooooong time. QRP and the simply life is the way to go!! Very innovative and imaginative transceiver. I understand making if for 80M because 40M is plagued with shortwave broadcasters, etc. However, I hope to see a 40M version in the future. Might not be too hard to do by offering shorting taps or a way to bypass part of the coil and a crystal change. To me, this would be advantage in that three switch contacts could change the transceiver from one band to the other. Even both crystals could be board mounted. Some “rubbering” of the crystal frequency could be done by the option of adding a variable capacitor and possibly a small choke in series with the crystal. It could be a variation of the Cricket as an optional purchase. Or the few extra parts could be offered. I like the board-etched coils. Construction simplicity is the best part of the radio. There is definitely a place for it. I’ve been listening to 3.579 MHz in the background for the past few hours. Just now I finally hear a station so the frequency is not dead. It’s from 8-land and I’m in 4-land. Therefore, it’s not a dead frequency. Brilliant design! the inductors are etched right in the pcb, uses common parts. The Crystal is a color burst 3.579 MHz which there are a lot of. Not like in the old days where you needed to get a custom crystal which is unlikely today. How about offering a 5 watt amplifier for the Cricket 30? Real QRP still but capable of a lot more contacts. Needs to maintai the QSK function. How about it NM0S ? ?